On Monday, they released an update of where magnetic north really was, nearly a year ahead of schedule. Will the new/forthcoming charts reflect this? I knew there was a good reason why we were taught Grid navigation all those years ago. When I checked with the CAA in late 2001 to see when we would need to change Farnborough from runway 07/25 to runway 06/24, having calculated from variation and rate of change depicted on the latest charts that we would need to change in about June 2002 , I found out it doesn't actually work like that. The CAA advised me that variation and its rate of change are calculated in advance for 4 year periods known as 'epochs' and our runway would need to change on or before March 2002, so I duly told the airport director asap as the runway was being re-surfaced and then got permission from our then aviation authority [MOD (DPA) ] to paint the new QDMs on the runway straight away rather than having to re-paint 6 months later. Interesting, but not altogether surprising, that the North and South magnetic poles are not moving at the same rate. Looks like the old mag.var. aphorism 'West is best' won't apply for much longer. Iceman wrote: ...the North and South magnetic poles are not moving at the same rate. We’ve been overdue a north/south swap for a few thousand years now. I was trying to remember the last time that I actually used a magnetic compass in flight. I think that it was last year on an instrument renewal when demonstrating a timed turn, having simulated loss of the HSI. matthew_w100 wrote: We’ve been overdue a north/south swap for a few thousand years now. Vesuvius is overdue for eruption too. 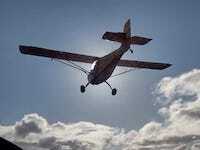 Iceman wrote: I was trying to remember the last time that I actually used a magnetic compass in flight. I think that it was last year on an instrument renewal when demonstrating a timed turn, having simulated loss of the HSI. It is a plan by those rascally Europeans to hijack the Greenwich meridian. But let's wait and see how the Telegraph reports it! I'm waiting for the Express to tell us how it'll bring on a new ice age.